Located in the chic 9th district in Paris, Hotel Corona Opera is 1 km from the Opéra Garnier. With chandeliers in the lobby, it features guest rooms with a flat-screen TV. 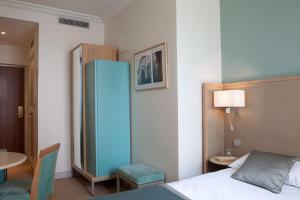 Each air-conditioned guest room is equipped with a minibar. They also have a private bathroom with a hairdryer. At the Corona hotel, a buffet breakfast is served every morning in the brasserie-style breakfast room. Room service is available upon request. With a 24-hour reception, additional facilities at the Corona Opéra include free Wi-Fi access and an internet kiosk at reception, available with an extra cost. The famous Printemps and Galeries Lafayette department stores are just a 15-minute walk away. Grands Boulevards Metro Station is just 260 metres away, providing access to the Madeleine Church. Public parking is available nearby at an extra charge. If you are travelling by car, please enter this address in your GPS device: 6, rue du faubourg Montmartre 75009 Paris. This room with air conditioning has a flat-screen TV, a minibar and a private bathroom with a hairdryer. 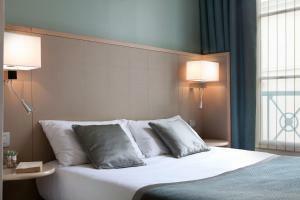 Rate: € 105.00 ... € 307.00; select dates below to get current rates. Rate: € 130.95 ... € 262.10; select dates below to get current rates. This suite is composed of a bedroom and a living room. It has air conditioning, a flat-screen TV, and a private bathroom with a hairdryer.